The Bully in the College of Charleston Opera production of “The Billy Goats Gruff” for area elementary schools. Each spring, opera students at The College of Charleston Department of Music perform a children’s opera at schools throughout Charleston County. 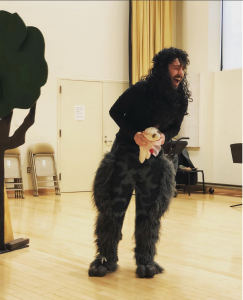 Operas are created and set to existing classical scores, and familiar children’s stories are adapted to focus on matters that have educational value for elementary school students. Performances are planned at Johns and Wadmalaw elementary schools; following each performance, students have the opportunity to engage with the singers and learn more about the art and craft of producing an opera. The Halsey Institute is organizing a multimedia exhibition titled Southbound: Photographs of and about the New South; the exhibition presents 56 photographers’ visions of today’s new south, and will be on view from October 2018 – March 2019. In conjunction with this groundbreaking exhibit, Arts, etc. will support the Institute in providing a program to Haut Gap Middle School and St. John’s High School students on the art of story-telling through photography and video. The project fosters an appreciation for photography as a vehicle for self expression and an understanding of photography’s role in documenting history and culture. The mission of Camp Inspire is to actively involve children in the learning process through artistic activities and lessons. With the arts as the basis, children become researchers in academic subjects such as social studies, science, and technology. Arts, etc. will provide scholarships for underserved elementary students from our community in grades 3 and 4 for this 2-week camp As they experience hands on learning through nature at the 864 acre Dixie Plantation, these students will increase their sense of wonderment and create art as they explore science and ecology.